Zak McKracken is back! And you can download it for free! 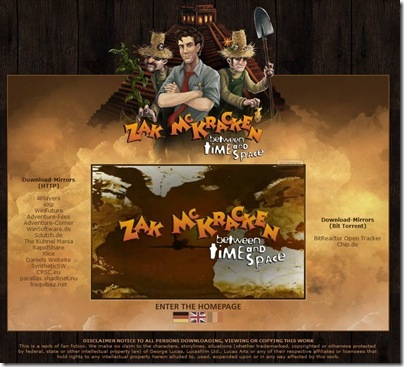 “”Zak McKracken: between time and space” is an unofficial sequel to the adventure game “Zak McKracken and the Alien Mindbenders” released in 1988. We, the “Artificial Hair Bros.” have devoted our time to create a worthy follow up to this all-time-classic. Capturing the mood and of the original game and creating something new nonetheless. It’s been a while since Zak’s last adventure. People have forgotten all about our hero who saved humanity from enslavement. His five minutes of fame went by way too quick and the money he earned with his award winning book went down the drains when Zak decided to get his own newspaper off the ground. Why a sequel to ZakMcKracken? Zak McKracken is one of the few adventure games that never got a proper sequel. There are no high-res backgrounds and no sweeping soundtrack, this left us with a lot of freedom when we started working on this game. We think that hand-drawn backgrounds made some of the old adventure games something very special. This is why we decided to keep the gameplay stricly 2D. But Zak:btas isn’t just a pixel-adventure, we have created the scenery and characters in our own graphical style and added 3D cut-scenes to add some diversity. How long did it take to develop this game? Work on the project began in 2002. In the beginning starting out as an amateur-game, we soon found ourselves reaching higher levels of quality step by step. By the time we are done 5 years of hard work will lay behind us. What problems had to be solved when making this game?